We were lucky enough to go away this weekend to see some friends. The drive was going to take anywhere between 4-6 hours depending on traffic so we knew at some point we’d have to stop to attend to the baby and have something to eat. On the way to our destination it’s a little bit easier because you can pack up food for the ride. We packed water in reusable bottles and sandwiches on flat bread. I wanted vegetarian options so I put some hummus, fresh baby spinach, and sun dried tomatoes on a flat bread with a spray of extra Virgin olive oil and salt and pepper. It was creamy and tangy. So delicious and you don’t even miss the meat. You can beef (Hah) it up by adding a slice of cheese if you want. Without the cheese, this would be a vegan sandwich. We did make a stop at a rest area for bathroom breaks but not for food! And that was a good thing because rest areas are very tricky to navigate if you’re hungry and cranky from being stuck in traffic. On the way home, we weren’t able to pack up food so we only had water on hand. When we stopped at the rest area the choices were Starbucks, Nathan’s and Burger King. Yikes. Usually the only vegetarian options are salads that are loaded with unhealthy toppings like cheese and creamy dressing. Or you can have a serving of fries (not my recommendation) because those are vegetarian though not very healthy. Fortunately for me, I don’t really like french fries. Plus, every time I visit a fast food restaurant I am reminded of the dreaded pink slime. Though McDonald’s has stopped using pink slime as of 2012, I still can’t get the idea out of my head of “boneless lean beef trimmings” out of my head. I am also reminded of my old Weight Watchers leader who told me that pink slime is treated with ammonia to kill E Coli bacteria. Yuck-y. I stopped eating beef at fast food restaurants then and there. So I’m usually ordering up some kind of chicken sandwich if I’m eating there at all. Until today. Hey, look at this! There’s a new turkey burger on the menu. I asked the woman who took our order if she liked it and she told me she’s never tried it. (Missed opportunity to give the employees a free taste to help them sell the new item, Burger King) I decided to give it a whirl because it might be a good option for those who don’t want beef and want something a little healthier. It turns out the turkey burger is coming in at 530 calories, which is not what I would consider a “healthy” option, but, it is less than the Whopper which is 670 calories. I imagine if I’d thought to ask for the turkey burger without mayonnaise I could have saved about 150 calories. Unfortunately, I forgot to ask, but that’s a trick I learned long ago in order to bring down the calories at a fast food restaurant. My other tip is to skip the cheese on the sandwich. 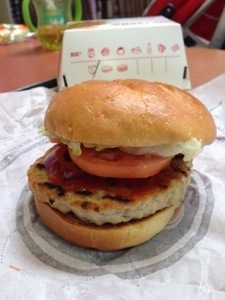 The turkey burger is served without cheese as a standard, so if you did add cheese it would probably be much more equal to the Whopper in calories than anyone would think. I guess in the end, I was probably about even on the calories but I enjoyed the turkey burger taste-wise and I was happy to not be eating beef. I also had water with it (no soda or diet soda) and didn’t have french fries. If we start looking at the calories for a “meal” with soda and fries we might all faint! As a side note, I was pleased to see Burger King had some better choices for the traditional kids meal. You get a choice of either fries or apple slices, and your choice of drink is expanded beyond soda to include juice or low fat chocolate milk. Again, not the ideal lunch I want to be serving Dylan on a weekly basis, but for the case of the occasional road trip, it was good to know there were healthier options. The main thing here is the we all have to stop being so hard on ourselves when we fall victim to the rest area food, or the mall food court, or the bible sized menu at Cheesecake Factory. The world is engineered in such a way to make us eat this crap. It’s not really our fault. The best we can do (if you still plan to live in society and not move off to a farm in Wyoming) is to make the best choices possible. That’s a good way to live life everyday too. Just make the best choices you can and feel good about that. For every vegetarian meal we eat and every organic bunch of bananas we buy we are making a difference with our dollars. The big companies pay attention to every dollar we spend, so make the best choices you can with that dollar so they get our message loud and clear. Your dollar is your vote. So, choose wisely. Today is My Love Affair With Cheese’s 4th Birthday! Happy Birthday, Cheese! Many thanks to all my readers, especially those who comment. Please like us on Facebook and follow us on Twitter to spread the love! We have big news in our household! My husband has agreed to Meatless Mondays. I had to them explain to him that fish is also considered a meat, so lunch could not be a tuna sandwich. I’ve been trying to institute Meatless Mondays in my own routine for a few months and unless we are out of town I have been very successful. I really like it because it forces me to think outside the meat-eating box. I have to come up with new things for dinner like a few weeks ago when I made this Mushroom Frittata which we really enjoyed. I also like to cook a big meal and then enjoy leftovers for a few days, so it’s great to have a meatless meal among the bunch. I really try not to make pasta for Meatless Monday so that I can broaden my horizons a bit. 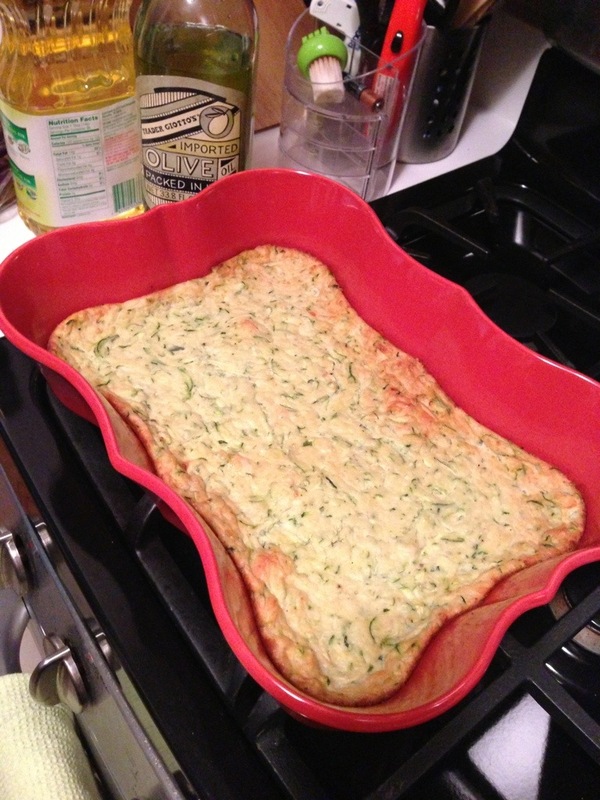 I went through my recipe cards and found a recipe for Zucchini Casserole that I had all the ingredients on hand for. It’s pretty simple to put together and needs to bake in the oven for 45 minutes, so I wanted to do it Sunday night because on Monday after work it would just take too long. I adapted this recipe from one on Skinnytaste.com. I figure for a dinner portion, this casserole will give you 6 adult sized portions. 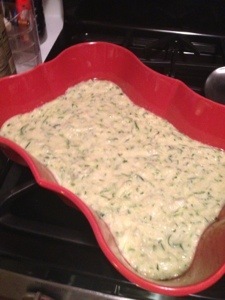 If you want to make it as a side dish, perhaps 10 servings is more reasonable. I plan to serve this tonight with a big salad and maybe a cold soup. I’m really curious to see how my 2 year old likes it! Let me know if you try this recipe and what you are having for Meatless Monday on Facebook or Twitter. I love this! Real food is not what’s filling our supermarket shelves anymore. That’s why Michael Pollan recommends shopping the perimeter of the store. That’s where the produce, meat, dairy and “real food” is. All the packaged stuff is in the center. 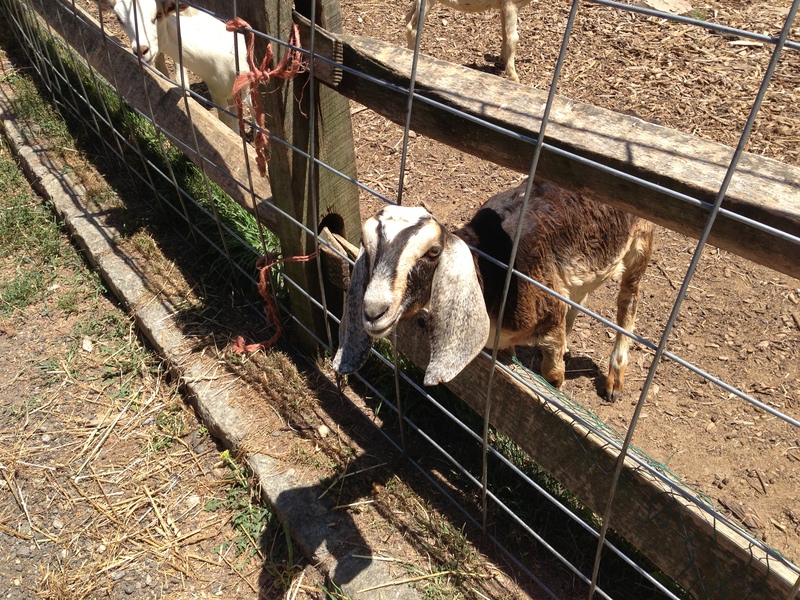 Last weekend I got to go back in time while visiting the North Fork of Long Island to see some family. My hostess, Helen, told me “everything out here is organic” because there are so many farms. She offered to take me to visit some while we were there. 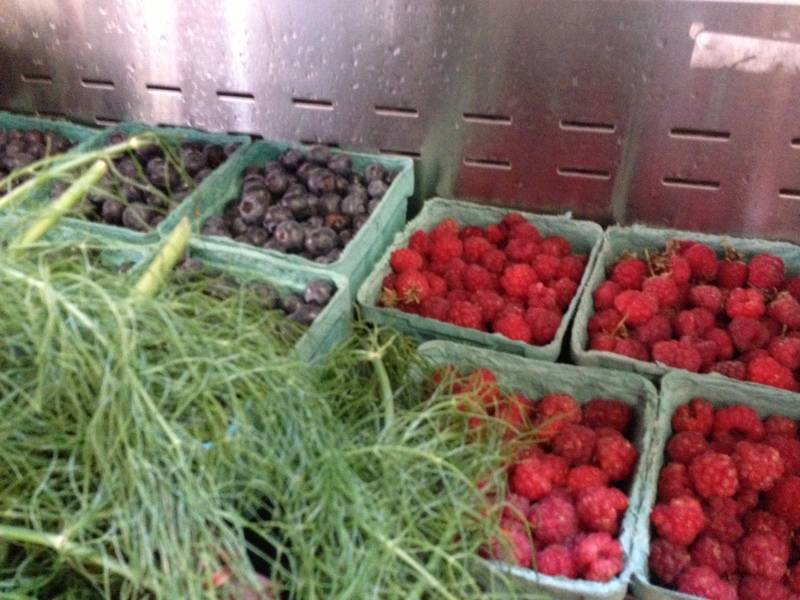 We went to Garden of Eve organic market which had fruits, vegetables, plants, flowers, everything! I wondered if you could actually do all your grocery shopping here? I think for many of us it would be a challenge without the packaged goods, but its possible. We bought items to make a salad: red onion, butter leaf lettuce, cucumbers and tomatoes. The butter leaf lettuce was actually buttery tasting which made me realize “Oh THAT’S why they call it BUTTER LEAF!” Duh!! It was the kind of salad that makes you realize salad is really tasty and worth eating. It just goes to show that the organic really tastes better and basically more like the “real thing”. I remember the first time I had an organic banana. It was the best tasting banana I ever had, and I had bought organic by accident I think so I was really surprised! 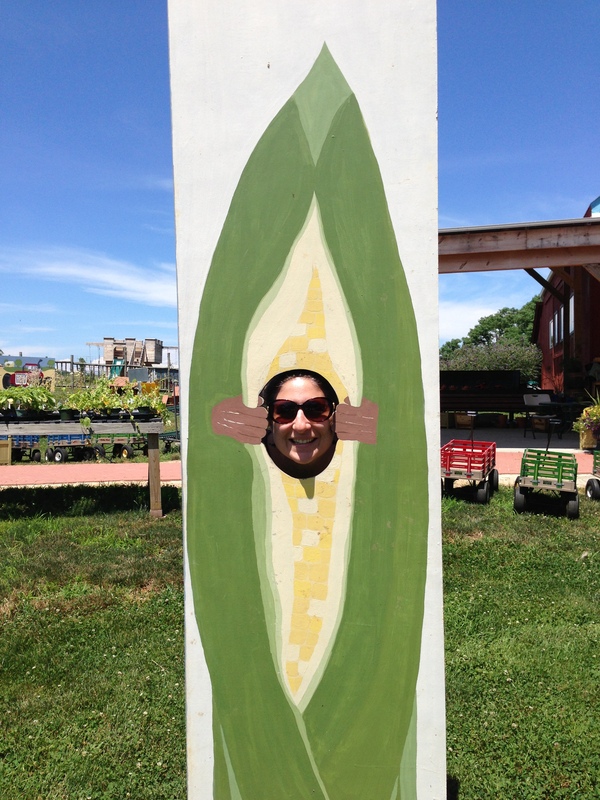 It just tasted more like a banana than any other banana I’d ever had. We hit up a few different organic markets including Sang Lee which I’m told is very famous. Each was a delight for the senses. 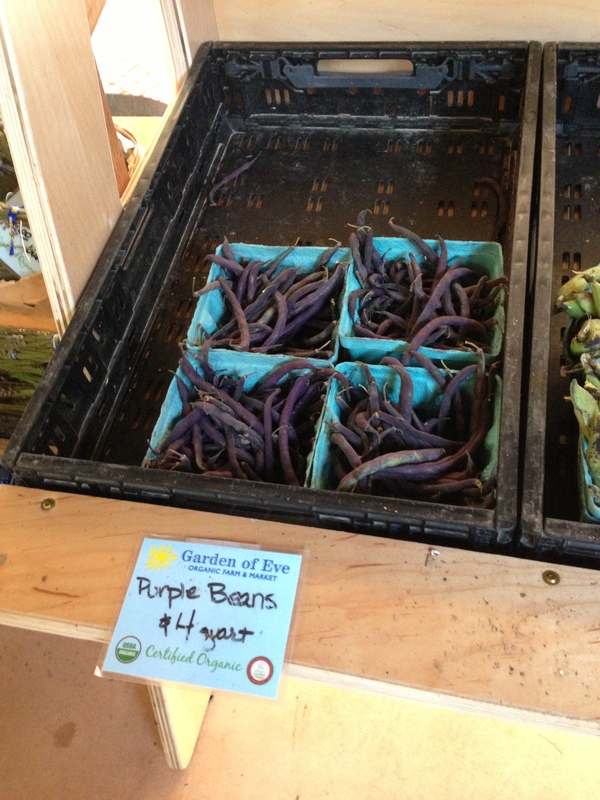 I mean, what they heck are those purple beans anyway? How do you cook those? There’s even fun stuff for kids (and me as you can see above) to give it a whimsical touch. Some markets have animals too! 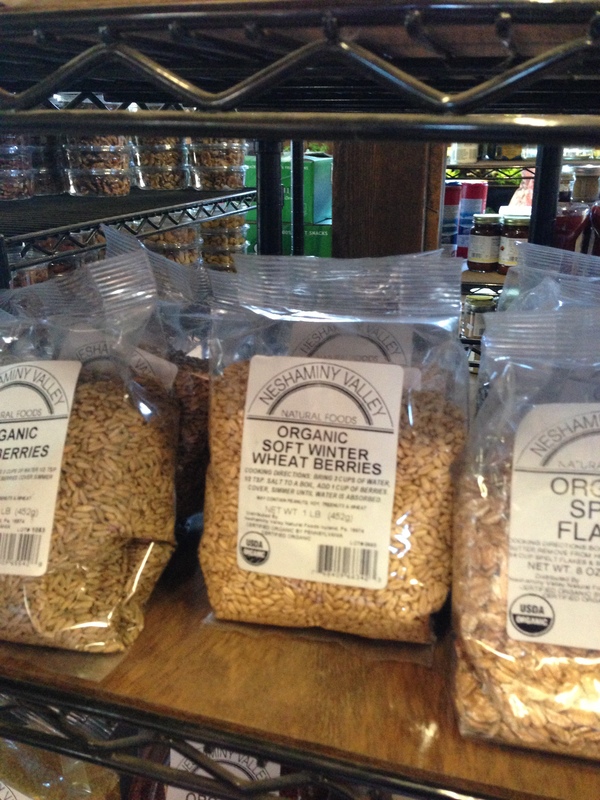 They also have a really good selection of whole grains. David Wolfe recommends eating these raw, but I didn’t go that far just yet! This is what supermarkets should look like! 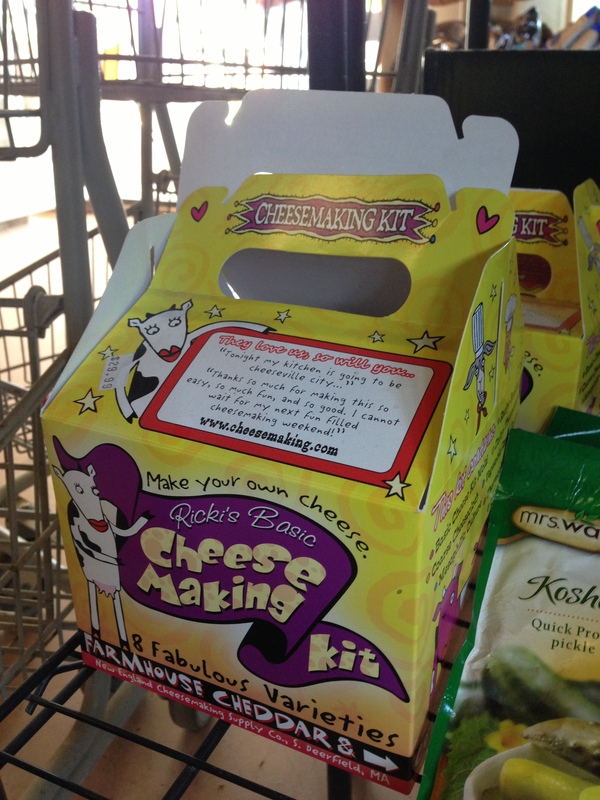 And then, there was this “Make Your Own Cheese Kit”. I didn’t buy it, but yeah, let’s make our own cheese. It reminds me of another thing I’ve heard Michael Pollan say, “Eat as many french fries as you want as long as you make them from scratch (I’m paraphrasing)”. And it goes back to eat what you can make. Making french fries is such a hassle that if you only ate them when you made them, you wouldn’t be eating them that often! That’s how I’m feeling these days. Just make your own food as much as you can. Then you know what’s in it and how it was prepared. 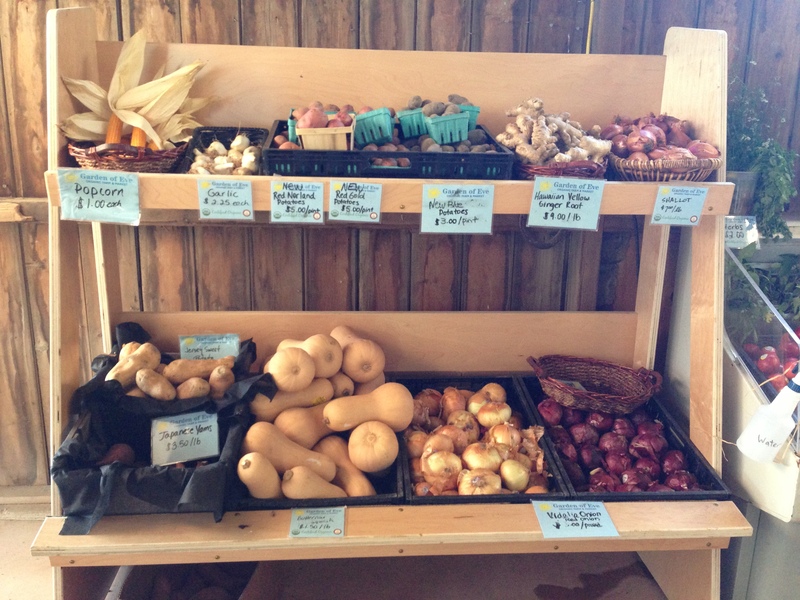 If you can’t make it to the organic market every week (I wish I could, but I can’t!) 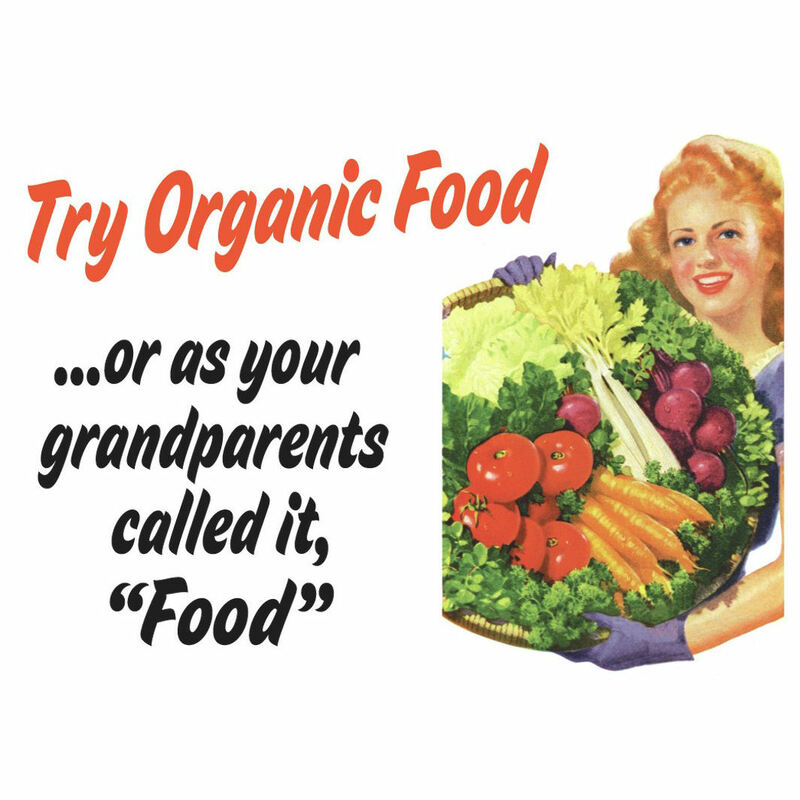 buy organic at the supermarket and be assured in knowing every dollar you spend on organic food is a vote for a different food system in this country. For more information on eating organic and finding ways to fit it into your lifestyle check out this blog from last month. 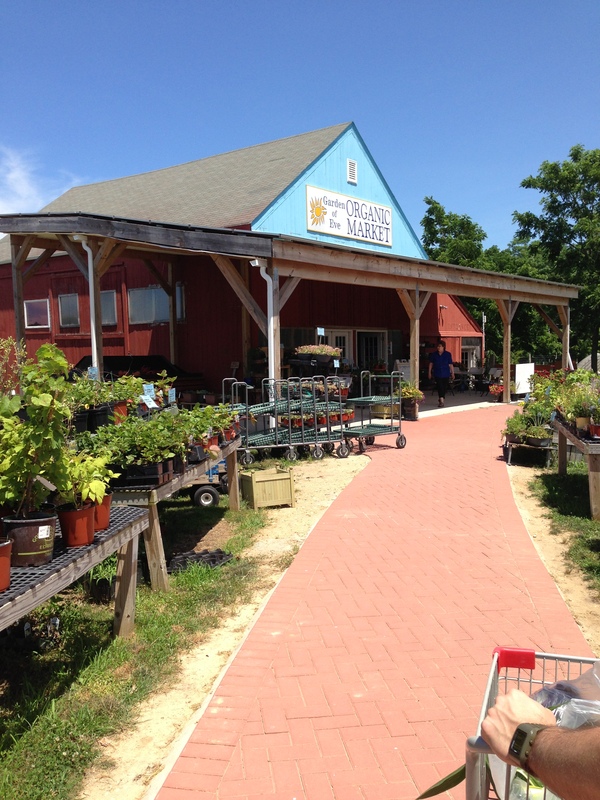 I can’t wait to get back to the North Fork for more shopping and salads! I can’t say that I’ve always been able to listen to my body. This is a skill I am only just learning after 31 years on the planet. For a while, I didn’t know if my body was talking to me, so how did I know to listen? I didn’t! Last night after a long day of driving, swimming and running around with kids at the family BBQ I decided a half cup of coffee would help me get through the drive home. 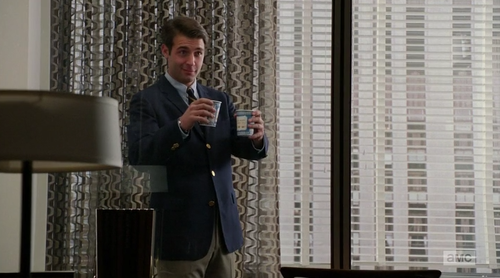 A half cup! So I had it, didn’t really love the taste of it (coffee and I have a love-hate relationship), and then we left for our hour long drive home. I got home, unpacked the bags, put the baby to bed, took a shower, and then I realized, its 12:45 and I’m still wide awake. Not in a good way though – like in a bad, “I’m gonna have to watch Downton Abbey” to fall asleep kinda way. Then I realized, “oh, maybe I shouldn’t have had that half of a cup of coffee at 10pm. Oops”. At that point, I remembered a few days ago when I had trouble falling asleep that I had drank some iced green tea before bed. I realized then, I can’t drink iced green tea before bed without suffering from a caffeine high. I have to say that I fall asleep with no problem regularly, so this was a real eye opener for me. I also don’t drink caffeinated drinks every day. I’ve never been much of a coffee drinker, craving more the heat of a hot cup of coffee or the cool of an iced one over the actual taste and caffeine buzz. Having this quick moment of conversation with my body was so important for me. I have always struggled to know what was going on with my body, not because my body wasn’t telling me, but simply because I wasn’t listening. The stomach aches, head aches, bad belly, and skin conditions are all symptoms my body is putting forth so I’ll do something about it. How many times did I have to eat eggplant and then get a stomach ache to realize that I have to take digestive enzymes with eggplant otherwise I can’t enjoy it? (I’ll get back to you on how many servings of eggplant an Italian girl named Marie could eat in 30 years). This was my body talking to me, all these years telling me secrets that I never heard. I just couldn’t read the signals, couldn’t tap into my own body chemistry which is the most powerful thing we possess. While I’m training to be a health coach, I am making every effort to listen to my body so I can get as healthy as possible. You know I’ve tried every style of eating known to man to try and find my bliss. It’s not so easy to listen to your body because we have so many distractions getting in the way on a daily basis. The laundry that has to get done, dropping off your kid at daycare, work, cooking, walking the dog, listening to a co-worker complain – all of it was distracting me from listening, ear to the ground, to what my amazing body was telling me. My body has served me very well these 31 years. It is always there for me when I want to go dancing, run around the playground with Dylan, go to Bikram yoga, and eat too much. Not to mention that it gave me my greatest gift – my son Dylan almost 2 years ago. Is it really so hard for me to just LISTEN? The answer is, yes, sometimes it is hard to listen. So now I’m gonna clear a little extra space in the corners of my mind to leave room for my body to tell me what the heck is going on in there. I’m also gonna take extra special care of my body because it always takes extra special care of me. 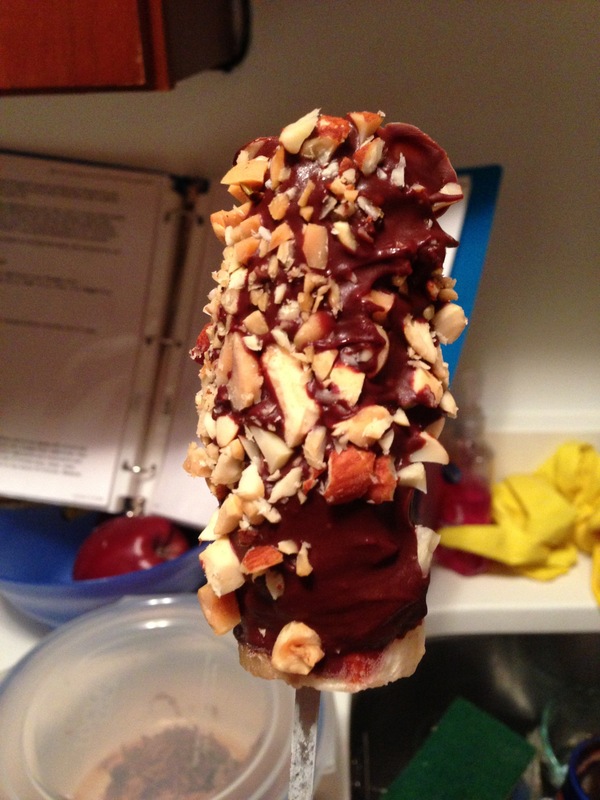 I’ve made these frozen bananas quite a few times and they really are a nice sweet treat. 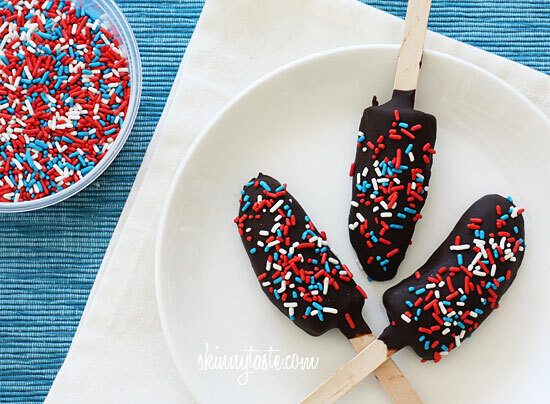 They couldn’t be easier to make, and they are a refreshing bite of fruit and chocolate on a hot day. They can also be red, white & blue as seen here to fit in with your Fourth of July festivities. Do enjoy the company of family and friends tomorrow. Do bring a dish you prepared and know is good and good for you. Do remember it’s a one-day holiday. Do fit in exercise so you get a healthy start on the day. Don’t go for that old mainstay of flag cake – try something new! Don’t eat to avoid talking to your family. Go for a walk instead. Or play with the kids at the BBQ. Happy Independence Day everyone! Let me know on Facebook or Twitter how you spent the day – the good and the bad! I made this deliciousness Monday night. 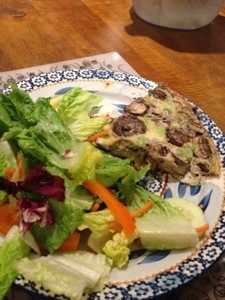 Wild Mushroom Frittata – for dinner! 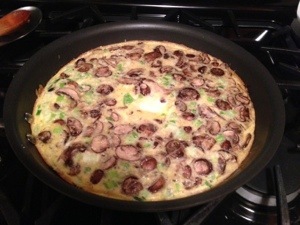 I found a recipe for Wild Mushroom Frittata that seemed hearty and easy to prepare. I served it with a huge salad and we loved it. The leftovers were great for lunch today as well. I used organic eggs, milk and an assortment of shiitake and baby Bella mushrooms. Using high quality ingredients really makes a difference in the overall taste. It made this dish mouth-watering instead of just some dry eggs for dinner. 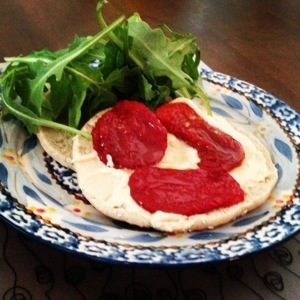 What do you make for Meatless Monday? Let me know on Facebook or Twitter!